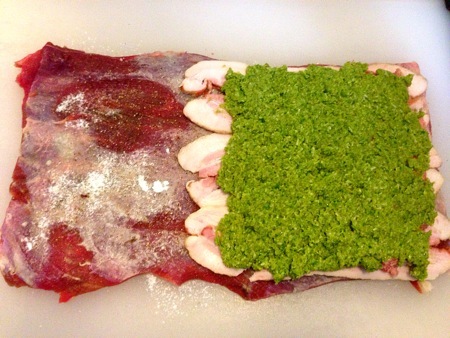 The sign on the blackboard at the farmer’s market stall said “beef belly.” Thinking I had an opportunity to make beef bacon (It’s a thing, isn’t it? ), I asked to see what I expected would be a thick slab of fatty beef. What I wound up buying was a very long thin piece of beef which may have been from the belly, but which had very little fat. The cut reminded me of braciole, a beef roll that is usually braised in a pot of tomato sauce along with sausage and meatballs. I decided to improvise a variation of the standard braciole stuffing (prosciutto, bread, cheese, pine nuts) and also use a different cooking method. 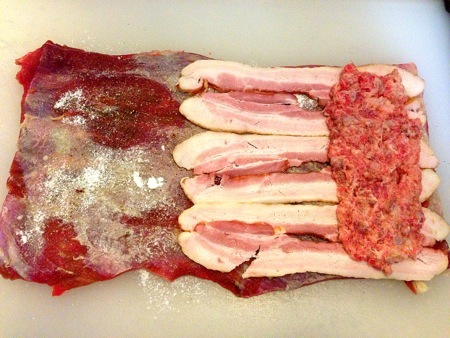 I layered some bacon over half of the beef, then spread a filling I made from the scraps remaining from trimming the belly into a rectangular shape. The last layer was a pesto I made with garlic scapes, toasted pine nuts, and parmesan. 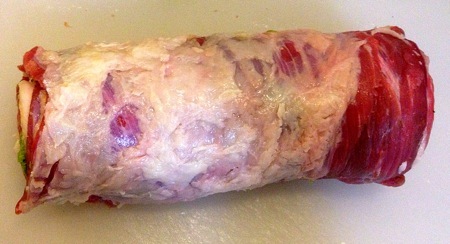 After dusting the exposed beef with transglutaminase (seen above), I rolled the whole thing into a tight cylinder. 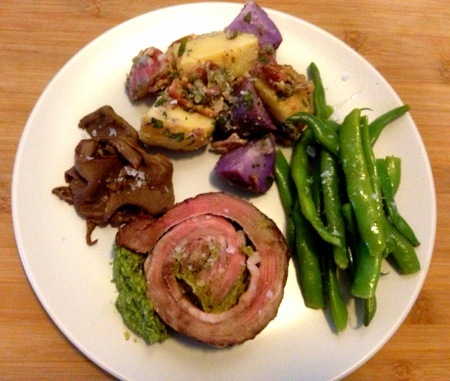 Some fat, some smoke, some bite from the pesto – this was a winning combination. I’d make it again, but I have never seen that particular cut available anywhere. 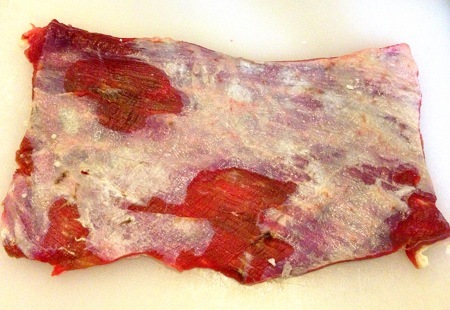 I may have to try butterflying a flank steak to get something long and thin enough to work with. ’cause that’s how I roll.